Remember that day dream I was into yesterday? Today, I was thinking of costs and how to keep them reasonable for a Wedding and of course both the Bride and the Groom will want to extend to their Brides maids and Grooms men a lasting memento and a thoughtful thank you gift for standing along side them during their nuptials! Thank you gifts do not have to be over the top expensive, but these must convey how thankful you are that these individuals in your wedding party are thought of by you and your intended. There are some wonderful gifts to give at very reasonable prices which in my humble opinion are super to give and to receive! These I happen to have shared with you today are merely a smattering of the wonderful and inexpensive gifts which may be bought through Etsy shops, of which there are hundreds and thousands of individual shops to choose from, all in the giant world wide mall which is called Etsy! 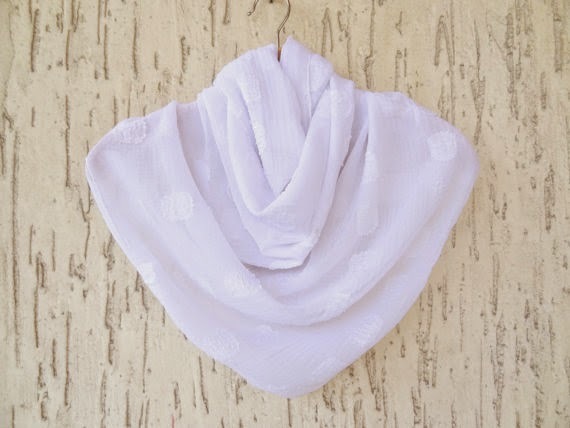 For the Brides maids you could select a number of beautiful gifts, one such beauty I discovered while browsing through Etsy shops was this gorgeous White Chiffon Scarf, soft, white and delicate making it a gift your receiver will make use of for years to come! Looking through this shop you will discover this beautiful scarf in other sumptuous colours such as turquoise or shell pink and I just bet if you speak with the shop owner you might obtain another colour other than what is currently listed for sale in this shop! This particular chiffon scarf may be purchased through the SevinchJewelry Shop! 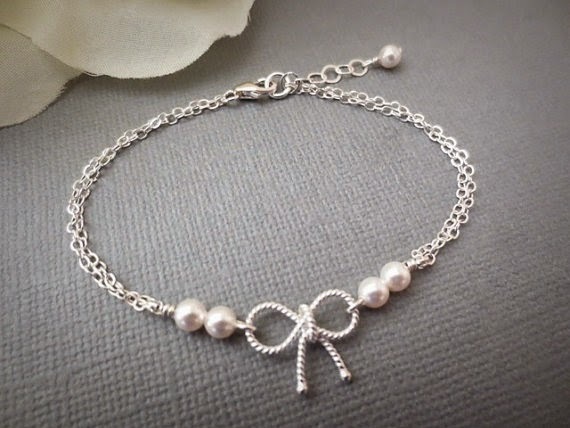 How about this reasonably priced and hand made delicate personalized Twisted Bow Bracelet from the TwinkleStar Jewelry a beautifully crafted lightweight piece any woman would not mind having around their wrist! 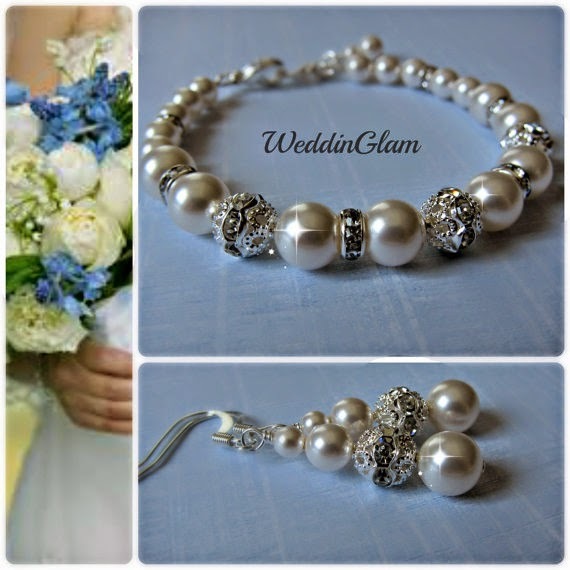 Or how about choosing this very delicate and pretty set of bracelet plus matched earrings hand made using classic Swarovski Ivory Pearls and glamorous Rhinestone Balls and Rondelles accents? Very affordable for such an elegant gift! Easily found at the WeddinGlam shop on Etsy! For those handsome and attentive Grooms men, possibly some of these may be a good choice as lasting thank you gifts to give and for them to receive? 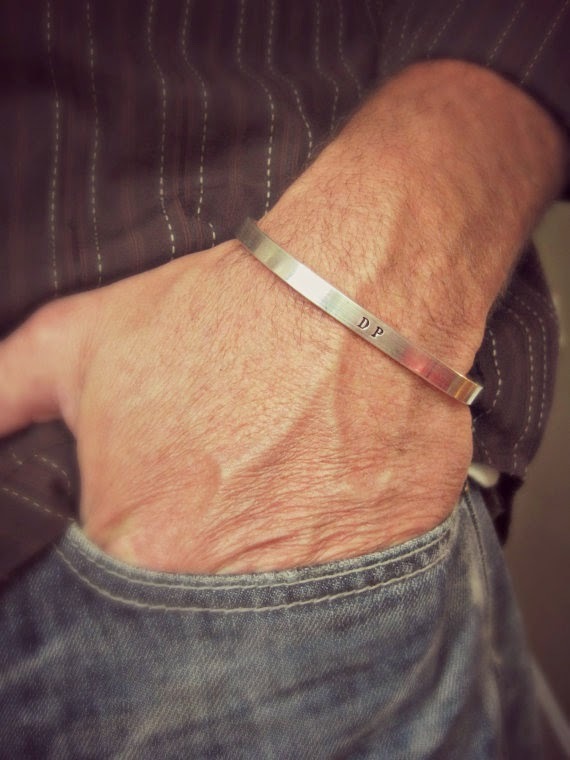 At the VintageStampJewels shop I discovered this masculine single band personalized Sterling Silver bracelet! This indeed would look attractive on any mans' wrist! It looks expensive but is classic in its design and its cost will not break the bank! 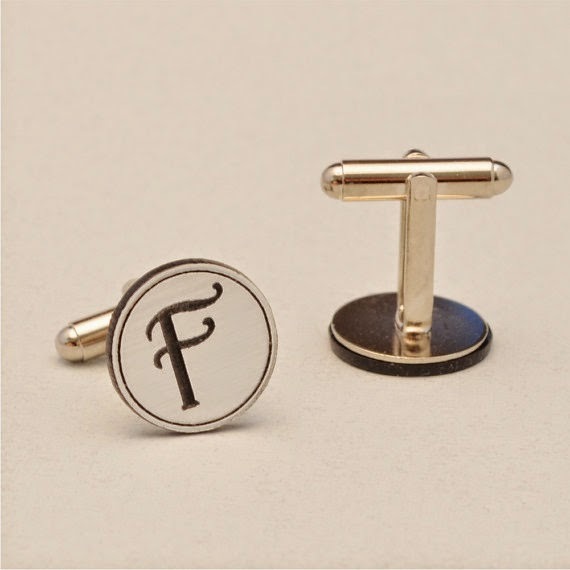 Or how about a stylish and distinctly sophisticated set of initialled monogrammed cuff links? I found these over at the OttavaDesigns shop! Any man can always use a set of cuff links and with his initial it makes the gift entirely personal and special! These are the type of links which can be worn in any year with any dress up or down attire! What man doesn't like using a pocket watch? 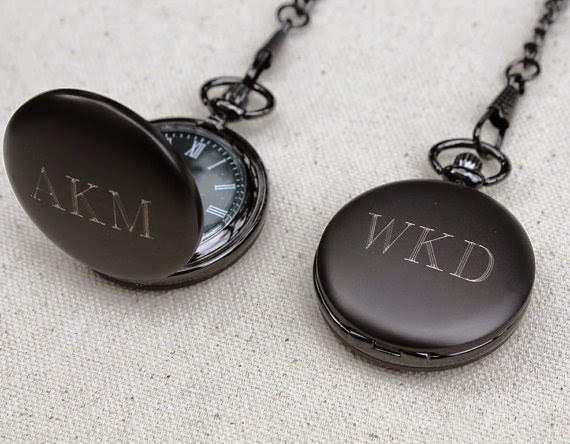 I found these exquisite personalized pocket watches over at the MyPersonalMemories shop! Once again a classy type of personalized gift to give any of your Male attendants and one which I am sure will be very well received! It is the most important event in a young couples life together, barring the birth of their children! When your friends consent to stand with you at the most important day in a couples life then the giving of thank you gifts with style and class is of importance. Personalizing thank you gifts is a thoughtful process wherein you express your deepest and heartfelt thanks to those who have been with you since the engagement and planning process of your momentous day! Thank you gifts do not have to be over the top expensive, but those gifts should be thoughtful, keeping in mind the character and personality of those who will be receiving what it is you choose to say thank you with and Etsy Shop owners are always at the ready to be of assistance to you in completing this important step along the way to your actual wedding ceremony! Planning for a wedding seems easy but it is quite difficult to find the right venues. The manager at banquet halls in Miami was so wonderful, personable, and responsive. We received the best possible service on our wedding day.